This time of year, in the middle of October’s bright colors, anything white in nature seems out of place: a McDonald’s napkin, a plastic straw, a Styrofoam cup, a cigarette that has been carelessly discarded before it has been smoked. All are remnants of human invasion; their stark brightness are reminders of places where we shouldn’t be. This is why I am struck by the stately bird wading through the shallow pond just off Peck Settlement Road. 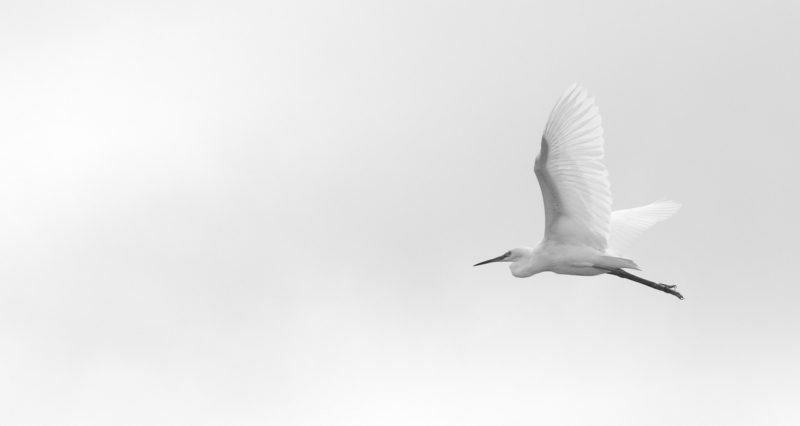 Its wings, as white as starched bed sheets, stand out against the murky waters and the thickets of cattails that are slowly splitting and dying. I drive past this pond every day on my way to work, often very early in the morning when night hasn’t quite let go of its grasp. On these Autumn days, my drive is often foggy, so I have to pay extra attention to the road in front of me. White-tailed deer linger in the shadows, as well as wild turkeys, groundhogs, rabbits, foxes, and even the occasional black bear. Children stand at makeshift rural bus stops, often located at the end of dirt roads. Although I am sure they have been told not to wander out onto the highways, they are children afterall, and even a small amount of jostling may send a wayward second grader sprawling in front of traffic. This white bird fascinates me. I pull over for a better look. Pure white birds are rare in this area. There are gulls and pigeons, but both kinds of birds are marked by subtle shades of gray. Occasionally, a Tundra Swan will get blown off course in migration, and just two years ago, rural Western New York, along with much of the northern United States, was treated with a Snowy Owl irruption, a term that always makes me imagine a volcano that spews feathers and wings, instead of what it really means which is that there’s an unexpected, and many ways, unexplained invasion of white owls from the Arctic tundra. Still, I readily recognize that the bird in front of me now is not a snowy owl. This bird, I will later find out, is a Great Egret. “They are rare in this area,” says Jan, who is a biologist on the campus where I teach. “But not terribly unusual,” she qualifies, telling me to enjoy the sight because the bird probably won’t stay for long. Later, I thumb through the pages of my worn field guide, and I find its drawing on page 49. The description notes that the Great Egret is a slender white bird that has a yellow bill and black legs and feet. Yes, this looks like my bird. The range map, however, is a little confusing. Shading on a small thumbnail map shows that the Great Egret makes its home along the east coast and the states in the far south. The interior is splattered with spots marked with two disclaimers: internal breeding sites very localized and range expanding. In other words, it seems to be rather hard to track the egret away from its normal coast line hangouts. As I study the map, I notice there is no shading over my part of the world. This egret seems to be far from home. Jan is right. The bird won’t be here for long. Still, as the days turn into weeks, the bird stays. One morning, when I find myself lingering too long on the side of the road while watching the egret, I think of the stories my father would tell me about the white buck that used to come out in the fields behind the factory where he used to work. Mostly, it was the workers coming off third shift who saw the deer, its white glow bright in the morning mist. My father admired the buck, talking about it at home. But he cautioned me to never harm a white animal. “Bad luck,” he said. I don’t know where this belief came from, except that it reflects other superstitions about animals that are seemingly out of place. Many of these beliefs have sightings of specific birds as bad omens. A sparrow loose in a house, for instance, means that someone in the home will soon die. A Barn Swallow that settles near a home foretells poverty. And an owl, any kind of owl really, that appears in the day suggests that bad luck is soon to follow. There is no question that the egret is out of place here. I hope its appearance is not an omen of bad luck or sorrow or grief. I have had enough of sadness. The following week I lost a student who had been in my creative writing class just the year before. More devastating news came when I learned that another former colleague and mentor had died after losing her battle with brain cancer. She was only 59 years old. I lost my mother seven years ago. I don’t say that there is no one right way to feel. I don’t say that the loss will never go away. I don’t say that the world will suddenly look different, although it will be hard to explain why. I don’t say that it’s disorientating to look at a landscape that should be so familiar, but suddenly isn’t. I don’t describe that landscape out loud. Still, I remember how in the weeks before my mother’s death the weather had been alarmingly warm, especially for the Snow Belt of rural Pennsylvania. Temperatures reached into the eighties, and on a walk through the woods that were located just a few blocks from our apartment, I had been amused that the only white I had seen were leftover milkweed seeds that were floating on parachute fluffy strands through the air. After my mother died, temperatures plunged and suddenly my world was coated in ice. Roadside guardrails were bent in twisted ways that I never noticed before. Trees stood barren, with a few withered leaves clinging to branches that were shredded and torn. Dried sumac berries that once brightened gray winter afternoons now only looked faded and worn. Wildlife had virtually seemed to have disappeared, with even the few song birds like chickadees shivering miserably in the cold. Still, life went on, as the often quoted cliché suggests, and that winter broke. Instead, of adding any kind of happiness in my life, I was angry. How dare the world move on as if nothing had happened? How dare the landscape struggle to look the same when nothing in my life would ever be the same again? Now, as I watch the egret wade through the shallow water, I think of two close friends who are fighting serious illnesses. I don’t know if either will be with me a year from now. Scientists frown at the concept of anthropomorphizing, or giving human characteristics to animals, but as I watch the egret, I can’t help but wonder if it does feel lost. There is so much here that has to look familiar: shallow water and songbirds that cling to dry weeds. But then there are the muskrats that trail through the dark waves, eagerly building their lodges out of leaves, sticks and mud. Wild turkeys hide in the roadside brush, with the occasional woodcock flying through the weeds. These are animals that would not be found in warmer, coastal waters. Even the texture of the waves has to feel different. The egret turns towards me, suddenly. I am sure that once it catches sight of me it will fly away, but it doesn’t. It doesn’t seem to care that it’s out of place here, that winter is right around the corner, and that a bird that is used to more tropical weather, will find itself lost in these icy shallow waters. It only continues to wade through the murky waters, gingerly, as if it is so sure that there is reason to stay.